i contacted the broadband helpline and went through the same thing time and time again, check this check that make sure cables are connected, do they think i'm thick, i've done all checks before i call, and done a line noise test. the last time this happened it was found to be a line fault outside the property and was fixed in no time, only after 10mths of calling and complaints. i don't get the downstream, just did a download test showking 2.17Mbs. anyone got any ideas,? could this just be another line fault. can they reset the DLM?. 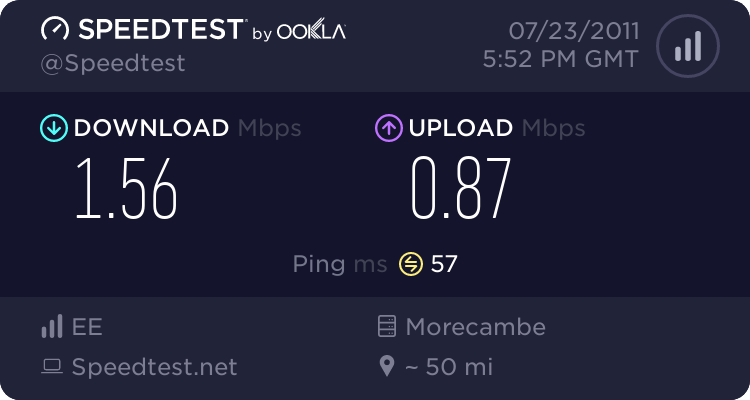 it's doing my head in that i pay for the best speed possible and get less than i used to, i would be happy if i could get the 5MBS back again. Have ran BT http://speedtester.BT.com/, but this keeps coming back Test Error, have done this numerous time over the past few days at different times during the day with the same result?. Have also tried Speedtest.net (can get download speed and upload results from here, but nothing like the stats from the LiveBox. 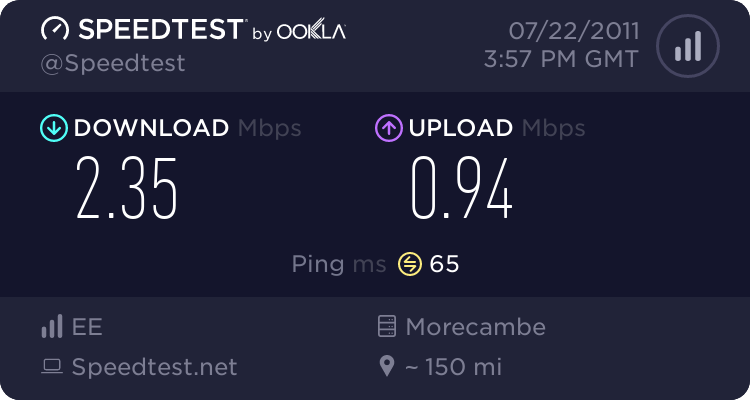 these speeds have been the best over the last two days, ran this about 4 times a day at different times, the lowest was 0.96MBS. I thought it may have been line noise, did 17070 option 2, but line seems to be clear, is there anything else i could try or test, before i have to ring the Orange helpdesk again. As you keep getting a Test Error then I don't think you've been switched over to the BT network yet. On 0range the default noise margin is 10 whereas yours is under that for reasons I can't explain..
On longer lines ADSL works better than ADSL2+ and you also get an increase in your attenuation of maybe 3dB. This results in a drop in speed and is probably the reason you're seeing slower speeds than before and possibly the disconnects. As for speed tests , you can't really take these too seriously as there are so many factors that can affect the result as I tried to point out earlier. I'd try to get 0range to switch you back to ADSL which should be much better for you, restoring some of your speed and stability. BTW how is your router connected to master BT socket? Do you have a Sk y box that's connected to the phone line? The router is connected direct to the BT master socket, which has a iPlate fitted (orange sent me this saying it could reduce noise on the line), also with a ADSL filter. There is nothing else on any of the lines in the house, except for the phone which also has a ADSL filter. I have tried calling Orange a number of times trying to get them to change me back from ADSL2+ to ADSL but they say they can't.?? Maybe with the Netgear router there's the option to set what connection type you can accept. If you have that option under the ADSL setting heading then try G.DMT which I believe is ADSL. Of course you might not connect at all but it might be worth a try. Hi I will give that a try tomorrow and get back with any results. If anyone has anymore ideas they would be welcome. Just one more thing, this has never happened before, no cable or filter changes or phone change, but now when anyone calls the live box re-sets itself....? No they don't, iwill call them today about it, first I will try another filter change just in case one is faulty. Funny how this has just started, tried it this morning by ringing from my mobile and did it again. Again your noise margin is all over the place so with that & the disconnects there's something seriously wrong with your line. Problem is getting that over to those idiots in support. Have been on all morning trying to get through to the Helpdesk without success, 45-50mins a time, so gave up for today. one thing seems to have rectified itself, the resetting of the Livebox when receiveing a phone call has stopped, it now stays connected???!!!. suppose i will have to leave contacting them until monday morning. will keep you posted about the outcome, just hope i an get this sorted out. will still try the helpdesk on monday and get back to you with the outcome. But are the router stats? Don't be too concerned about speedtest as they're so unreliable. At the bottom of that page there is probably a "Show Statistics" button. Also I edited my previous post with 2 other speedtest sites. Editing posts can get confusing when we're both doing at the same time. The noise margin is way up on the downstream, maybe you give it sometime for 0range's DLM to readjust things. I think it runs almost continuously. It's likely that whatever was causing the disconnects when the phone rings has caused the DLM to downgrade your line and now that the disconnects appear to have stopped then the DLM might progressively improve your line. Worry only about the router stats & forget speed tests for now.